Simply Stunning. 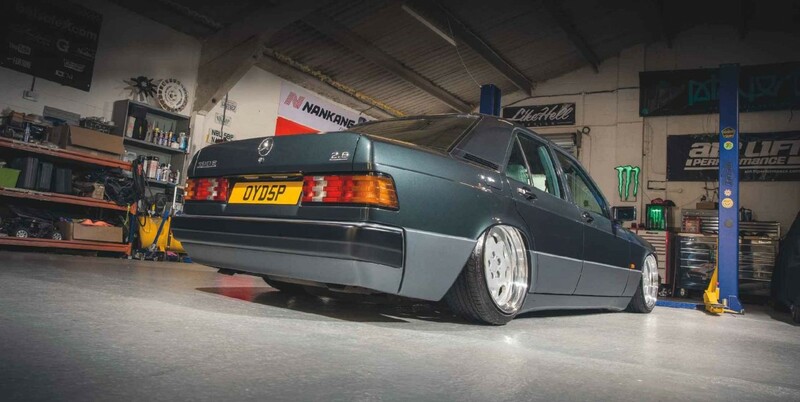 There’s been no Merc-ing about with James 190E here, just a few mods to achieve automotive enlightenment. Words: Danielle Bagnall. Photography: Dan Pullen. BONUS SECTION MERCEDES 190E / Stunning 190E There's not a whole load of mods that have gone into this immaculate 190E. The mods that have though, add up to much more than the sum of their parts. In the modifying world some people are lucky enough to have a natural eye for making stuff look good. It doesn’t take qualifications, the attendance of university or after school clubs, some people are just born with it. James Brown is one of those guys. The Essex-based sales manager is no stranger to the car scene of course. 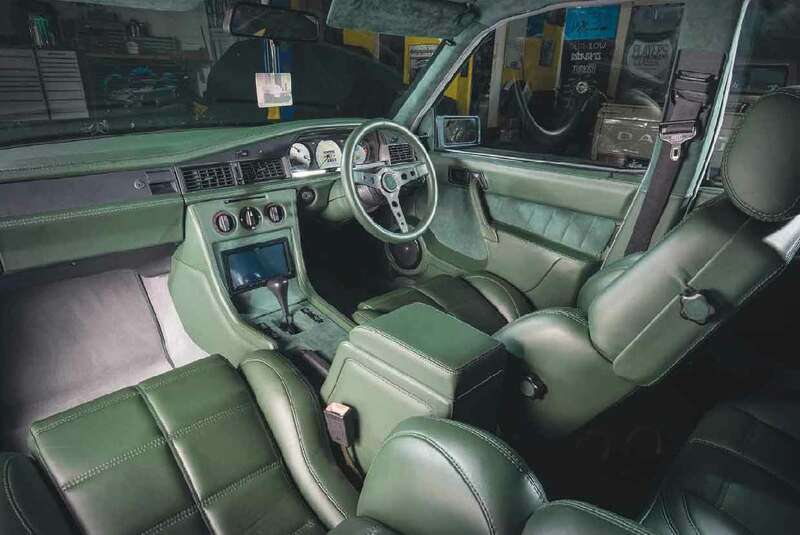 His previous retro projects have included four separate versions of the Mercedes 190, as well as a few Essex-specials including an XR2i and a Fiesta RS Turbo. He’s even had a pink 106 GTi over the years… although he said; “don’t ask”, and we’re more than happy not to! Sales man by day, owner of The Play Bay by night, James is also Essex’s answer to Hugh Hefner… well, purely in the detailing sense you understand. 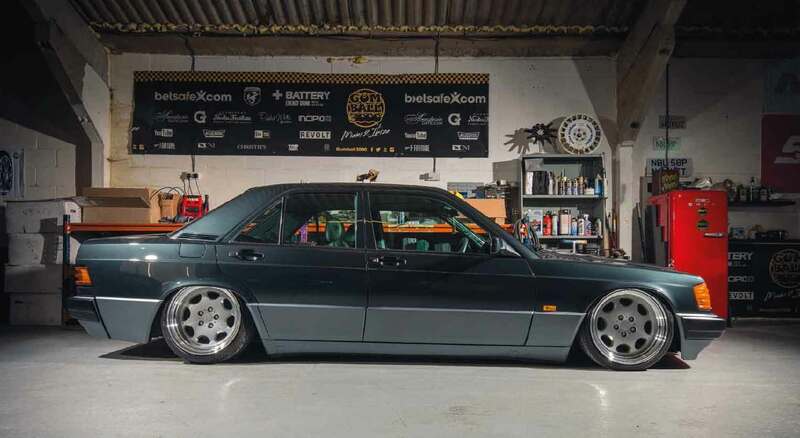 The Play Bay is James’s side piece where he works wonders with the polish, and that’s pretty evident from the lustrous finish of his awesome 190E here. 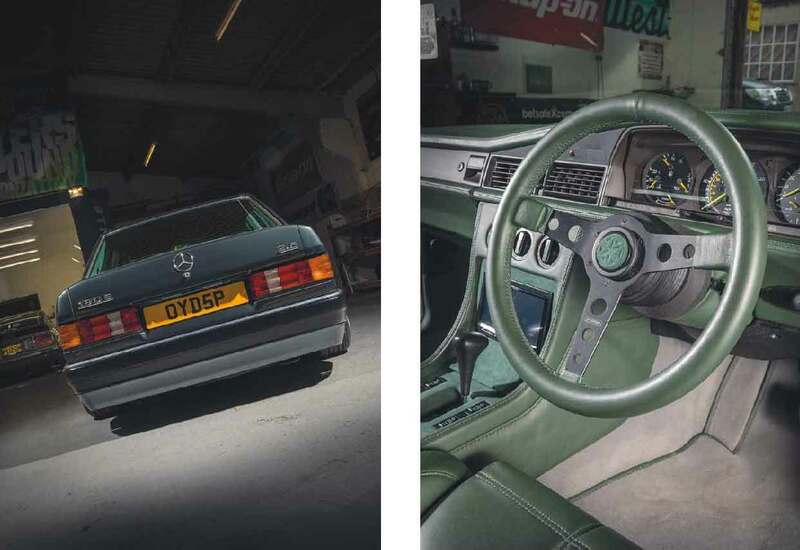 He first purchased this particular Mercedes around three years ago, completely standard and sporting a true icon of the 1980s - that 166bhp 2.6-litre lump. The only question was, what can you do to such a coveted modern classic without going right over the top? Especially when you have a penchant for modifications and have already owned your fair share of supremely-fettled Mercs. But there was no question about buying the car he’d wanted since childhood. “I’ve always loved this shape – I’ve already owned four, but never had the 2.6-litre. It was just time to scratch the itch, I guess,” he says. Quite sensibly though, when he finally got his hands on the car, the first job wasn’t any modifications at all. It was more of a maintenance affair by having all the gaskets changed and the engine and gearbox thoroughly serviced. What’s important here too, is that the same, rather considered, approach has followed the rest of the build. I guess you could say, more than anything, this car is a simple case of enhancement through modifying. There’s not loads of outlandish tweaks done for the sake of making changes. Much more deserving of the base car, the outside consists of a couple of nips and tucks, using the two oldest tricks in the business – a supreme drop and a jaw dropping set of wheels. OK, so maybe you can’t call them sensible in the strictest sense of the word, but there’s no denying that the overall effect is enough to make grown men weep with desire. This joy of this project is that it’s all about simplicity, and making what Mercedes built just that little bit more special. 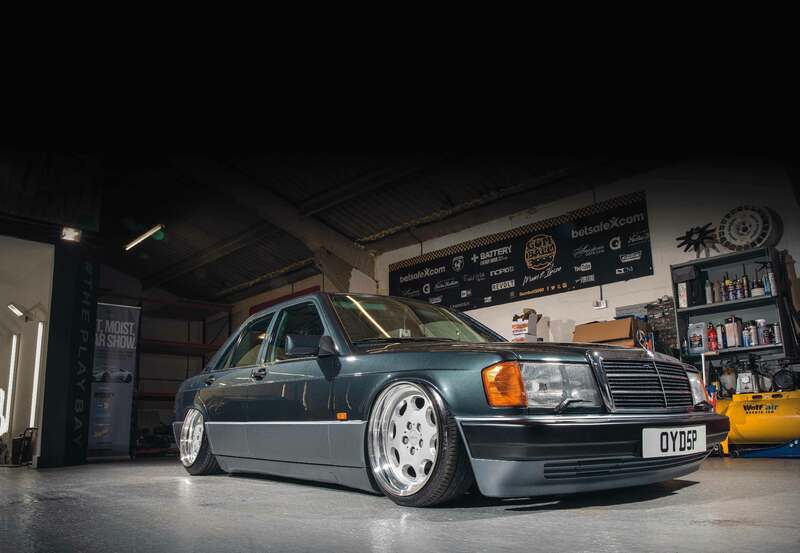 We think you’ll agree, that’s not an easy trick to pull off with a legend like the W201 190E! Like many a retro project, particularly one that’s built in such a 21st Century way, this car is put together entirely around the wheels. These stunning 8 and 9.5x17-inch Rotiform MBZ hoops were ordered first so the guys at Plush Automotive could get the car perfectly slammed over the top on a custom air ride system. Now, if you don’t know Plush, they happen to be one of the UK’s leading air suspension and interior specialists. And that’s pretty handy because there’s not what you’d call an abundance off-the-shelf kits out there for the 190E. 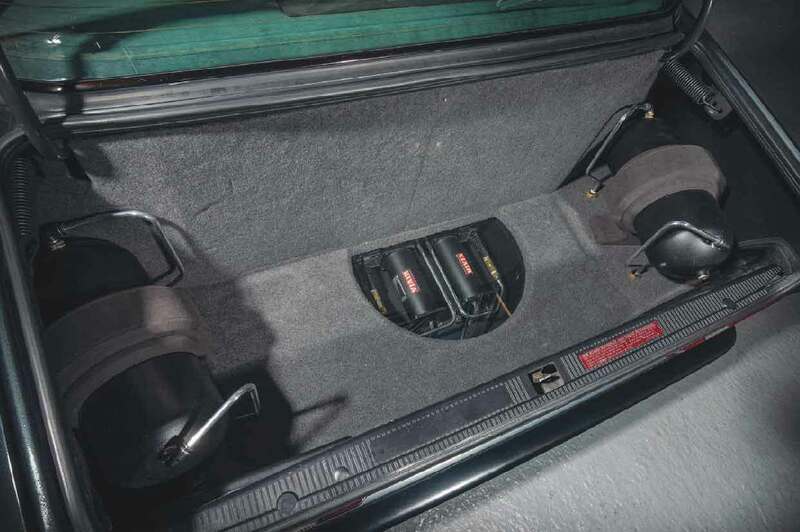 Instead they set about re-working parts to make up their own; the result being some BMW E36 Air Lift Performance struts at the front, together with a fully-custom rear set-up, all managed by an Air Lift V2 system. With the all-important way the car sits sorted, finishing off the outside immediately grabbed James’ attention and he decided to go all-in on the paintwork. He may have got away with a deep machine polish of course, but at this level who wants to just ‘get away’ with anything? Instead the car was shipped off to Jags Bodyshop in Stapleford Abbots and treated to a full respray in the original Mercedes 199 colour. But not before they added a little girth by pulling out all four arches. This width, together with the air ride, gives the whole car serious presence and, this was enough for James… well, for about a 18-months anyway. 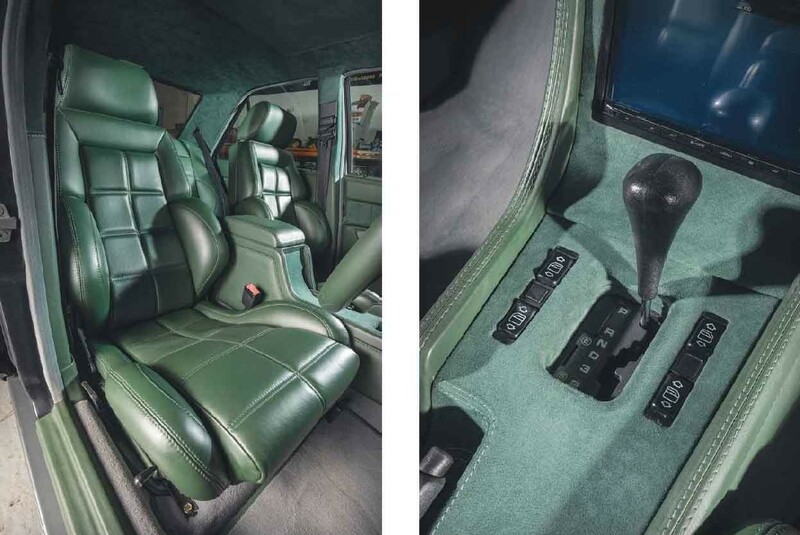 The work included new grey carpets throughout, Recaro classic seats trimmed in green leather, Cosworth rear seats retrimmed in green leather and a custom centre console, you guessed it, trimmed in green leather. The doorcards also have a custom speaker set-up that’s trimmed to match and even the dash hasn’t escaped the leather treatment. All this is topped off with a custom Alcantara roof lining. Phew! So, what’s next for James and his Merc? Well there could be some engine modifications along the way, possibly even a swap, but what’s important for now is that his stunning 190 proves that a few mods can go a very, very long way… just as long as you pick the right ones. Not all modified cars have to be utterly bonkers, big-power race weapons. We love fast, old motors of course, but sometimes a lesson in restraint, coupled with a keen eye, is all that it takes to create something truly amazing. There’s no denying that’s what we’ve got here, and for that James we salute you! Thanks: “The guys at Jags Bodyshop; SFP Design; Plush Automotive; Rotiform; Air Lift; Kenwood; Meguiar’s.